A page with shackled hands. She's afraid to move beyond the known. 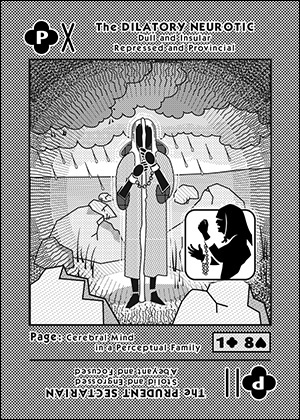 A Cerebral Mind in a Perceptual Family. Dilatory, because, like the 1 of [--] she is plagued by inertia. Phobic, because, like the 8 of [ / ] she sees darkness encroaching. Dull, because, like the 1 of [--] her mind is suppressed. Insular, because, like the 8 of [ / ] she is very provincial.